I’ve been riding the Epic, ‘au original’ since I took it off Ken’s hands. The stubby stem, and short straight handle bars gave the bike a super responsive fell and promoted a pretty aggressive body position that I liked a lot. It was made for zipping through tight, twisty single track. That said, this week I swapped it all out though. Although the original set up was nice, in my opinion it was set up for shorter distance races. After 2-3 hours on the bike, my wrists, shoulders, and neck would really start to ache. Booo hoooo, I know, I know… But this wasn’t something I was thrilled to have to deal with on the TR. Given the discomfort after 2 hours, 6 hours would be horrendous. So, I’ve opted for a less cool looking, but more comfort focused cockpit, with one additional spacer ring, a slightly longer stem and riser bars. 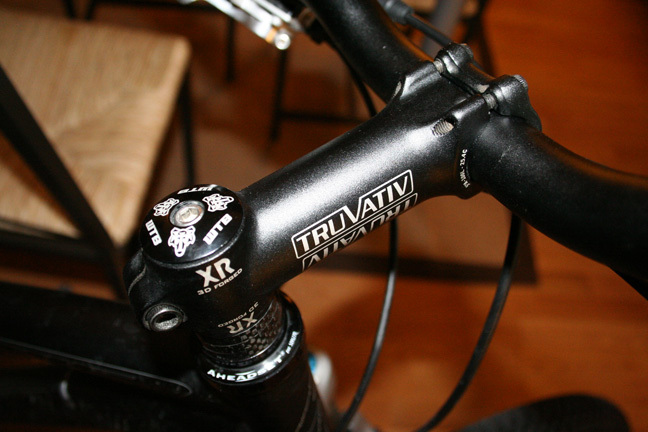 This might be a drastic change, but this was essentially the set up I had previously with the Jamis XC Expert. The change has stretched me out a little, but still forced me to sit up a little more than before. Tonight, after a 4 hour ride, the result was next to no wrist or shoulder pain at all. My neck was still a little vocal, but what can you expect after 4 hours. All in all, I think this will be an important change going into the TR. Any level of discomfort I can mitigate without sacrificing too much performance is going the be a good thing.